Every year, I look forward to getting an early look at all the exciting developments presented in ASHG abstracts. As an abstract scorer, I am even more enthusiastic when the abstract is easy to read and evaluate. Read on for tips to elevate your abstract during scoring and get started writing. → Ready to submit? Visit the abstract submission site. When scoring an abstract, I generally do a quick read through the abstract to get an overall feel for the study being presented. During this first pass, I also try to get a sense for how organized/well-written the abstract is as well as a sense for how ‘excited’ I am about the content. I then do a more careful read to determine: (a) is the aim (hypothesis) of the study clear? (b) are the methods clearly outlined? (c) are there results presented – not just promised – in the abstract? Do the results seem valid? These may seem like simple things, but I can’t emphasize enough the importance of a well-organized abstract that is easy to follow. If the reviewer has to work too hard to figure out what the abstract is about, it will be difficult to score it well. Although reviewers are all ASHG members, and we try to select reviewers with sub-topic expertise, remember that your reviewers may not be experts in your specific area. Your abstract should be clearly written with enough background to put your research into context and highlight the importance of your data. Don’t put it off until the last minute – give yourself time to draft the abstract and to get input from others before you submit! The highest-scoring 10 percent of >3000 submitted abstracts are awarded speaking slots, and only twelve of those are chosen for plenary talks. Abstracts that make good plenary talks address all of the points above. In addition, they present results that are novel and that represent a significant advance in the field. Often, the work presented is fairly ‘mature’, but this doesn’t mean the project has been going on a long time. The work presented has a clear hypothesis, approach, and results that represent a new finding. Abstract reviewers dedicate 4-6 hours to score approximately 150 abstracts in just one week. I always learn a lot when reviewing abstracts! I think you really get a feel for what is up-and-coming in the field, and it’s a good experience that is helpful for writing your own abstracts in the future. The hardest part is that it is time consuming. You want to make sure you are giving each abstract full consideration, and that just takes time. ASHG’s double-blinded review process is important for scoring and selecting the best abstracts. It decreases bias in that the reviewer does not know from which lab or institution the abstract is coming, whether the first author is a student, fellow, junior faculty, or PI, or what the gender of the submitter is. I think that reviewers appreciate the blinding as much as the submitters. 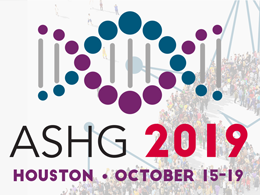 Submit by June 7, 2018, to have your work considered for ASHG 2018. Then, check out the overview of ASHG’s abstract review process and register to see all your colleagues’ impressive research. Heather Mefford, MD, PhD, is Chair of the 2018 Program Committee. She is an Associate Professor of Pediatrics & Genetic Medicine, Director of the Mefford Lab at the University of Washington, and Deputy Director of the Brotman Baty Institute for Precision Medicine. She has been a member of ASHG since 2006.